The bill is designed to enable the abdication as a one-off, exceptional case without changing the basic framework for Imperial succession. Emperor Akihito reportedly expected that the debate on his retirement would also cover such related issues as possible expansion of the role of women in the Imperial family. But the government of Prime Minister Shinzo Abe, which feared that touching on such issues could shake the traditional Japanese view of the nation, maneuvered to ensure an early conclusion of the debate without seeking any fundamental reform of the Imperial household system. The emperor is different by nature from the constitutional monarchs of other countries that have royal families. It is impossible to understand Japan’s national character without comprehending this difference. The emperor was regarded as a living god until 1946. The emperor under the old Constitution was not only institutionally deified but also had enormous spiritual influence over the Japanese people. Douglas MacArthur, the commander of the U.S. Army forces in the Far East during World War II and supreme commander of the Allied powers during the postwar Allied Occupation of Japan, decided to indirectly rule Japan while maintaining the Imperial system instead of direct administration by U.S. forces. There was heated debate among the Allied powers over whether the Imperial system should be abolished. The definition of the emperor as the national symbol was conceived as a political compromise to settle the issue. This does not mean, however, that the emperor as the national symbol is similar in nature or function to the British monarch, who “reigns but does not rule.” In contrast, the emperor was considered a descendant of the gods. In 1978, the so-called Class A war criminals, wartime Japanese leaders who were convicted of serious war crimes in the International Military Tribunal for the Far East, known as the Tokyo Trials, were enshrined at the Yasukuni Shinto shrine in Tokyo together with other war dead. This move echoed the nationalist ethos of the traditionalist movement. Akihito’s father, Hirohito, was infuriated at this attempt to exonerate Japan and stopped his regular pilgrimages to the shrine, which he had visited every five years. Emperor Akihito has never visited the shrine since he ascended the Chrysanthemum Throne. 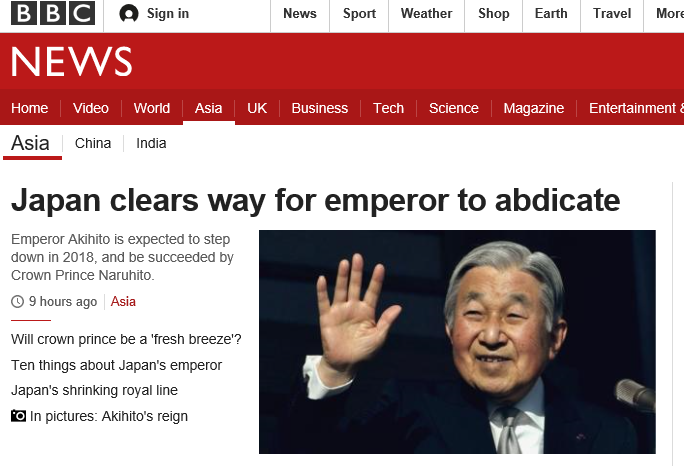 Unlike his predecessor, whose status changed from living god to human being as a result of international politics, Akihito has always been the emperor as national symbol since his accession to the throne. People close to the emperor say Akihito thought he would not be able to serve as the symbol of “the unity of the People” if he relied only on the traditional authority of the emperor. As a result, he has based his public service on two key principles since he ascended the throne in 1989. One is strictly adhering to the pacifist principles of the Constitution and, specifically, making as many trips as possible to console the spirits of war victims in countries where Japan fought in the war. What does Abe intend to do to cope with this sticky question? The nation is facing a crucial choice concerning the issue of Imperial succession. Should it choose to restore former Imperial family members to their previous status in order to maintain an unbroken line of emperors that supposedly dates back to the gods? Or should it opt to allow succession in the female line in accordance with global trends? Tackling this hugely complicated and politically fraught issue, requires a leader with considerable courage. Given the Japanese tendency to put off grappling with sticky challenges, this problem seems likely to remain untouched until the very last moment, perhaps when the Imperial line is about to die out. Copyright © 2017-2019 Logos and Mythos All Rights Reserved.